South Korea is often cited as a case of miraculous transformation from poverty to prosperity. Korea’s achievement of moving from one of the world’s poorest countries as recently as the early 1960s to the ranks of the ten biggest economies only four decades later has rightly attracted interest from policymakers and scholars alike. 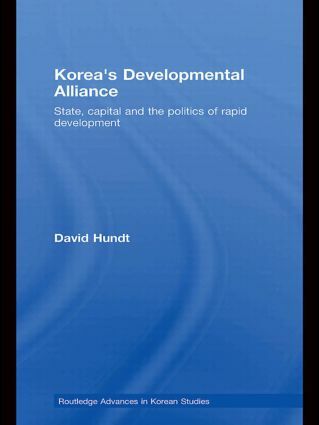 This book identifies the factors that shaped relations between the state and big business in Korea, the ‘developmental alliance’. These factors offer a cogent framework in which to identify and predict changes in power relations between government and business. Rather than merely offering a means of explaining the rapid-growth phase of Korean development, the politics of the developmental alliance also help us understand how and why the Korean miracle turned to crisis in 1997 and why the subsequent recovery has been so uneven. In this way, the book highlights the political power of business, which is often underplayed in discussions of the development of Korea. It also sheds light on the constraints on policymakers during modernisation, and how power is shared among a small number of powerful parties.